Despite the rain in the night, we awoke to overcast but dry weather and packed up quickly while the tents were dry. Breakfast was quite a social affair as most of the Coast to Coasters from the camping field had booked a cooked breakfast. The process of ordering and getting food on the table took a while as there was only the landlord serving but the breakfast, when we got it, was fine except for some reason, he seemed to have assumed that I didn't like hash browns, at least that's the way it seemed, as everyone bar me received one with their breakfast. After we had finished eating, Alan, myself, and a walker called Peter, who we had met at the campsite in Reeth, had our picture taken outside the pub before setting off for the Cleveland Hills. Although it was still dry, it wasn't looking promising and as we climbed through the forest towards the summit of Beacon Hill, the first drops of rain had started to fall. This was quite a disappointment for me as when I had previously walked the Coast to Coast in 1998, the worst weather I experienced on the walk was on this stretch so I had been looking forward to seeing the hills in a better light. Once on the summit, we were exposed to the full force of the elements and with the wind now blowing strongly away from the shelter of the trees, the rain began to intensify and as we briefly dropped down into trees again, we stopped to don our waterproofs before we became too wet. The Cleveland Hills is a wonderful stretch of the walk, in fact Wainwright describes it as the best outside of the Lake District and I have to say the switchback ridge of hills on the edge of the North York Moors is an exhilarating walk. Soon, we were plodding through torrential, driving rain and as water began to find it's way into my waterproofs I looked forward to the Lord Stones cafe where we were stopping for lunch. This is located at a beauty spot on a minor road on Carlton Bank and is a traditional stopping point for Coast to Coasters. The next section I remember mainly for the rain and the fact that I felt extremely fit and energetic as I powered over the hills towards the promise of a hot cup of tea and something to eat. The walkers from the pub the previous evening were all strung out along the ridge and Alan, Peter and myself reached the cafe first and stripped off our dripping waterproofs. Our clothes underneath were soaking wet despite the fact that most were wearing good quality clothing. We ordered hot mugs of tea and sausage baps followed by caramel slices and as we sat, more dripping, bedraggled walkers came in to the warm haven of the cafe. It's during conditions such as this that the camaraderie felt among walkers comes to the fore and we sat in a group chatting about the walk and the weather and our experiences so far along the way since starting out in St.Bees. 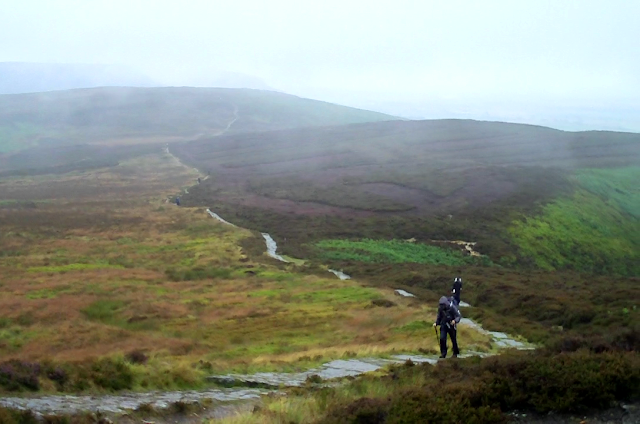 Eventually, it was time to put our wet gear back on and head off out into the elements. This section in the guidebook ends at the road at Clay Bank Top before heading off across the North York Moors and walkers face a choice of a 2.5 mile walk into Gt.Broughton along the road or a further eight mile walk to the Lion Inn at Blakey Ridge. We had decided the previous evening to book into a guesthouse in Gt.Broughton and given the weather conditions, I was extremely glad that I wouldn't be pitching my tent this evening. The rain had not eased as we left the cafe and we plodded on across the hills, squelching through the driving rain before arriving at a choice of paths below The Wainstones. Here, we said goodbye to Peter, who was carrying on to the Lion Inn and followed a signpost for Gt.Broughton heading along a track through a pine forest. The rain seemed reluctant to ease and in fact, as we followed the track it actually became even heavier, sluicing down through the trees and flooding the ground and causing us to detour around some of the larger puddles that covered the entire track. Eventually, we reached the road and as we descended into Gt.Broughton, the rain finally eased, just as it had thirteen years earlier. We reached the village and had to phone the guesthouse for directions but were soon stripping off our wet gear in the garage of the house before being shown to our room by a lovely lady who told us that there would be a pot of tea and cakes waiting for us downstairs as soon as we had sorted ourselves out. Soon, we were sat in the conservatory looking out across the garden to the ridge of hills that we had just traversed as we relaxed enjoying the tea and cakes but I couldn't help but wonder how the other walkers from the Blue Bell were faring in the conditions. Later, we walked into the village and enjoyed dinner in a pub, grateful that we had decided to book into the guesthouse instead of camping in the very wet conditions. Hopefully, tomorrow would bring better weather.